Acrylic nails are best removed by a professional nail technician, but if you need to remove yours and can't make it to the salon, you can remove them at home if you're willing to take your time and follow the steps necessary to protect the health of your natural nails. Before you get started, gather all the needed supplies and prepare a comfortable your work area -- the removal process can take 30 minutes to an hour or more. Cover your work area with a cloth or newspaper to absorb any accidental spills or drips. Using nail polish remover, remove nail polish completely from your nails. Cut your acrylic nails as short as possible with a pair of nail clippers. Make sure your nail clippers are strong and sharp; otherwise, the acrylic nail will break when cut. File your nails as short as you can. This will make removing the acrylic nails as easy and painless as possible. Fill a glass bowl from 1 to 2 inches deep with acetone nail polish remover. Apply a thin coat of petroleum jelly to the skin surrounding your nails. Do not apply to the acrylic nails because it will slow the removal process. Set a timer for 15 minutes. Place your fingertips in the glass bowl, making sure the acetone nail polish remover is covering the entire acrylic nail. 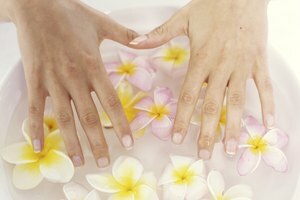 Allow your acrylic nails to soak for the entire 15 minutes. Remove your fingertips from the acetone. Scrape off the top layer of the acrylic nails using a cuticle pusher or similar tool. The key to removing acrylic nails at home is taking your time and not rush the removal process. Set your timer for another 15 minutes, and allow your acrylic nails to soak in the acetone again. Allow your nails to soak for the entire 15 minutes. Gently try and peel the acrylic nails off the surface of your natural nail. Do not force the acrylic nail to separate from the natural nail. If the nails do not peel off, scrape off the top layer of acrylic. Repeat this process until the acrylic nail has been completely removed from your natural nail. Wash your hands to remove any acetone nail polish remover and petroleum jelly from your skin and fingernails. Allow to dry completely. Lightly buff the surface of your natural fingernails with a nail buffer. This will remove any remaining acrylic and glue from the surface of your nail. Apply a layer of clear nail polish to your natural nails. This will protect your natural nails since they tend to be delicate after the nail removal process. Allow the polish to dry completely. Apply a moisturizer to your hands and massage into your skin, paying special attention to your fingertips. This will prevent your skin from drying out after being soaked in the acetone nail polish remover.